As 2015 draws to an end, the California Water Commission, tasked with allocating funds for water storage projects under the Water Quality, Supply, and Infrastructure Improvement Act of 2014 (Proposition 1), is beginning its formal rulemaking process to inform how funding will be prioritized and to determine the grant application process. Proposition 1 sets aside $2.7 billion in bonds to invest in water storage projects. Expected to begin in 2017, Funding can cover up to 50% of a project and at least 50% of such funds will be used for ecosystem benefits. The Water Commission completed a scoping survey earlier this year to gauge prospective applicants’ interest in the program. A sample of potential projects include CalFed’s Temperance Flat Project (average yield: 96,000 AFY, cost: $1.0 – $1.4 billion), Tulare Lake Project (capacity: 70,000 – 120,000 AF)1, and CalFed’s Sites Reservoir or North-of-the-Delta Offstream Storage Project (average yield: 500,000 AFY, cost: $4 billion). However, these expensive megaprojects are not the only ones on the table. Groundwater storage and conjunctive use also qualify for the Water Storage Investment program. With potential storage capacity between 850 million and 1.3 billion acre-feet throughout California’s 515 groundwater basins, groundwater recharge and storage offers a much lower cost than other surface storage projects. The final regulations and guidelines, which are due in the coming months, will help to determine whether California is ready to move toward the ‘soft path’ for a sustainable water future. The largest seawater desalination plant in the United States, with 50 MGD capacity, officially opened on December 14, 2015. Located in Carlsbad, in San Diego county, the plant can meet 7 to 10 percent of the region’s demands if operated at full capacity. This $1 billion project is expected to increase potable water bills for an average customer by about $5 per month. Due to the technology’s high energy use, plant officials plan to spend about $200,000 a year to buy carbon offsets. The plan also includes the San Diego Bay environmental mitigation program, but further study is required to understand and quantify long-term environmental impacts (e.g., effects on marine life from the plant’s seawater intake and brine disposal) of desalination. 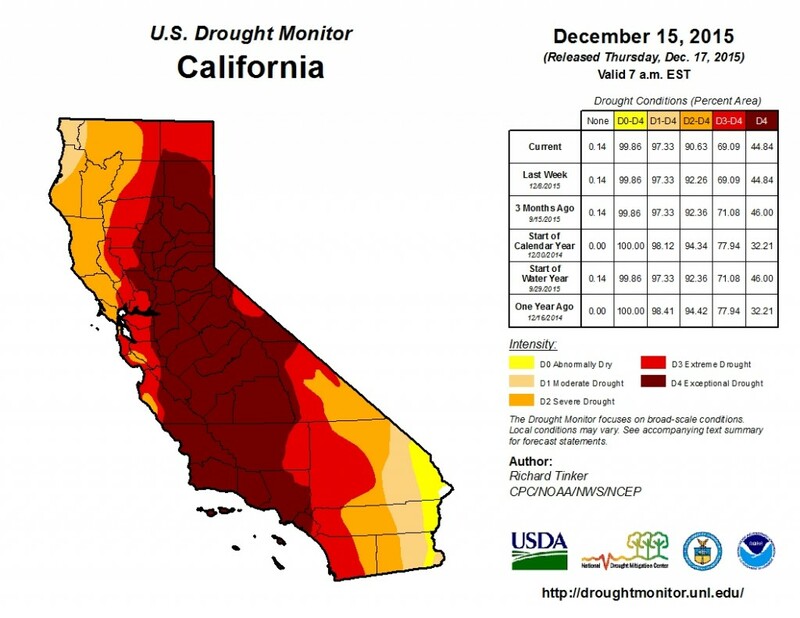 The Natural Resources Defense Council (NRDC) recently issued a report card for the state of California’s drought responses. The report covers five strategies identified to achieve a sustainable and drought-resilient future. The state made the most progress in urban water conservation, scoring a B through achieving water conservation targets and implementing strategies to improve plumbing fixture and appliance water use efficiency. However, it failed to make any headway to improve the San Francisco Bay-Delta ecosystem, receiving an F as a result. Scores of B-, D, and D were given to water recycling, agricultural water conservation and efficiency, and storm water capture and reuse, respectively. Also, see the State Water Board’s response here. The 2016 State Water Project allocation is initially set at 10 percent of most SWP contractors’ requests, or about 420 thousand acre-feet. This allocation may change throughout the year given current and projected hydrological conditions. Last water year (1 Oct 2014 – 30 Sept 2015), initial allocation was at 5 percent in November, decreased zero percent in January, then increased and remained at 5 percent for April until the end of the water year. A Republican-backed drought bill (“The Western Water and Food Security Act of 2015”), which aims to maximize deliveries from the Delta and boost water storage, reuse, and recycling projects, will not be included in the must-pass $1.1 trillion omnibus spending bill. Disagreements between Democrat and Republican lawmakers were mainly on operational criteria of the Delta and environmental protection. The State Water Board voted against a plan to hold back an additional 200,000 acre-feet of water at Lake Shasta through October 2016. The plan would help to ensure that water released into the Sacramento River would be cool enough for next year’s juvenile salmon run. Instead, the new order provides more flexibility for the Central Valley Project (CVP) and the State Water Project (SWP) operations, requiring a temperature plan and setting 1.6 million acre-feet storage volume as the planning target. Drought conditions improved slightly from last week after the weekend storm. Regions with severe drought decreased from 23% to 22%, but areas with extreme drought and exceptional drought remain the same at 24% and 45%, respectively. 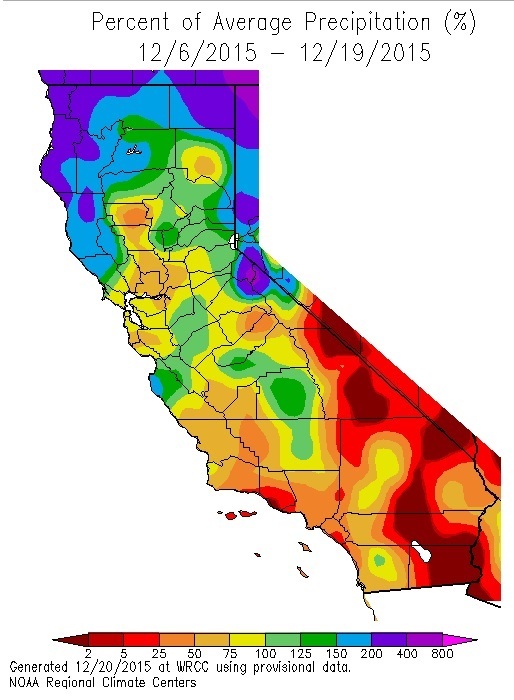 Statewide weighted average precipitation is at 82% of the historical average. Snow-water equivalent average for the state is currently at 6.9” or 83% of normal for December 15. 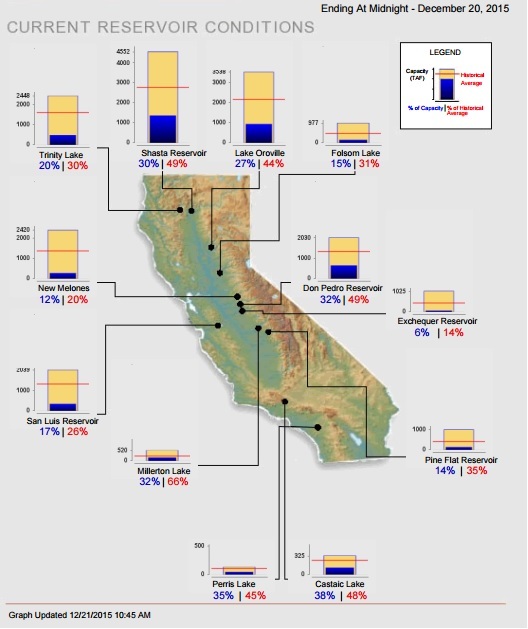 Statewide, California’s major reservoirs (representing 27.3 million acre-feet of storage) are at 24% of capacity and 43% of group average. 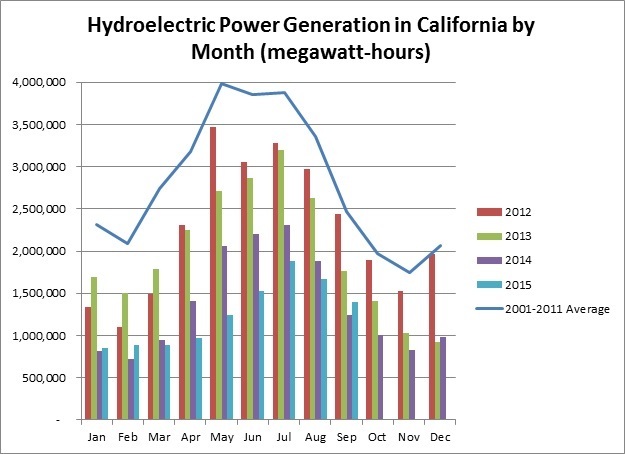 Hydroelectric power generation in September this year was 12% higher than 2014, but 43% lower than the 2003-2013 average.